Volunteers are important members of our team at Gillette Children’s Specialty Healthcare. Our volunteers promote family-centered care and improve the patient experience. Each year, they contribute thousands of hours of support for our patients, families and staff. 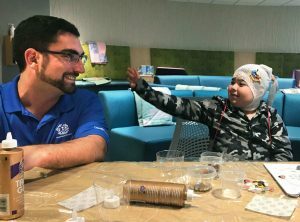 One volunteer, Andrew Leitner, often comes in to do arts and crafts with the kids who are staying at Gillette for days or even weeks at a time. His connection to Gillette is twofold. In addition to being a volunteer, he is also a former patient. After his sophomore year of high school, Leitner was pitching during baseball practice when a line drive up the middle drilled directly into his skull, giving him a traumatic brain injury (TBI). His skull cracked, he lost consciousness and he was rushed to Gillette. He spent three days in the hospital recovering from emergency neurosurgery and then was sent home to heal fully. Volunteers like these are a wonderful example of the compassionate service and caring smiles you find at Gillette. Each of our volunteers helps brighten the lives of our patients and families with a positive spirit. Gillette has many more volunteers spreading joy throughout the hospital; some are even our four-legged friends! Pet Therapy teams volunteering at Gillette Children’s Specialty Healthcare have taken one step further to take part in the Animal Assisted Therapy (AAT) Program, helping to motivate patients after surgery in their rehabilitation. Heather Micek, mother of Kaidyn (pictured above), has seen the benefits of Animal Assisted Therapy. 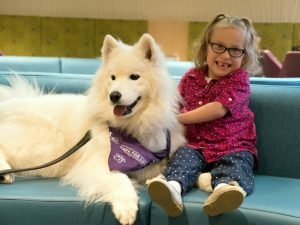 “There were days that Kaidyn didn’t want to do her therapy, but when the dog was there, it made it seem like nothing bad could happen,” says Micek. “Kaidyn has a dog at home and having a friendly animal nearby made her feel safe. I think most pet owners can identify with that feeling.” Fundraising monies from Children’s Miracle Network Hospital donations help Gillette patients experience the positive benefits of AAT. To donate and help further fund therapy programs like this, click here.